Wordless Wednesday – The Oatmeal Nails Marathons … Again! Just a quickie today (for real) – I LOVE the web comic ‘The Oatmeal’ and the extent to which he ‘gets’ runners (and especially ‘former fatty’ runners) is a blast to read. Two things – a cool new comic and an upcoming book! 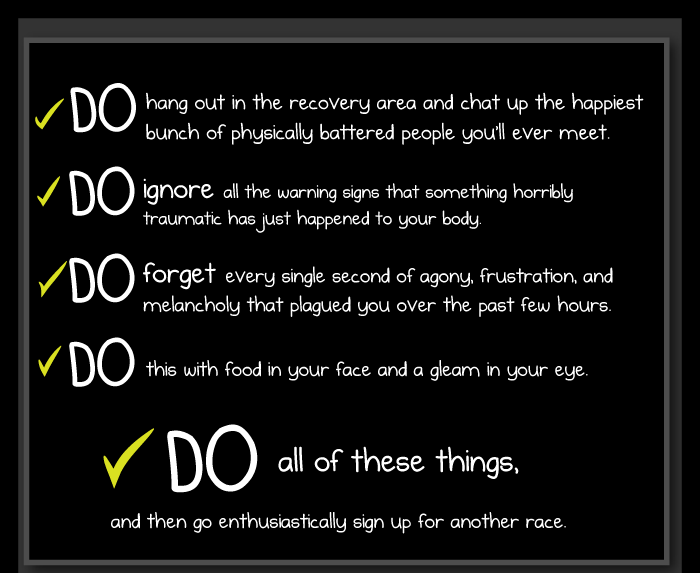 The new comic is called ‘The Dos and Do Nots of Running Your First Marathon’, and it is hilarious. I don’t want to spoil too much of the fun, but I grabbed part of the ending sequence of panels below. Have you seen this comic? What did you think? This entry was posted in Running and tagged Comics, Humor, Running by txa1265. Bookmark the permalink. Totally agree – and I think all of us harbor our own personal Blerch! Mine makes me mix chocolate powder into a jar of peanut butter, and eat the diabolical concoction straight with a spoon. What does your Blerch make you do? Whew – since I scheduled this yesterday I have seen it shared on Facebook about one billion times (including by me) so I am glad that someone hasn’t seen it 🙂 And if you haven’t read his stuff, he has a monumental comic series on running that is totally worth the time. I love The Oatmeal so much! Beat the Blerch half marathon is now on my racing bucket list. haha – I hope you get there! I love the Oatmeal! I saw this comic the other day, but actually didn’t read it because for some reason I thought it wasn’t new. I will read it right after submitting this comment! I’m sure it will be witty and full of truths because it is Matthew Inman, after all. Have you read his blog post from a couple years ago about running an ultramarathon? Good stuff. Definitely! I don’t remember when I first saw his stuff, but have always tried to keep up. I also assumed this was old until I saw his notes that this is new and from the upcoming book. I loved how everyone in the bloggo/twittersphere was blowing up over this yesterday. I thought that was as hilarious as the comic itself! The best part about that comic is that it is 110% true. I had to laugh at all of it because I saw so much of myself and other people I know in it! I totally thought about posting a link to that comic on FB this morning, but I didn’t see it until I was about to leave for work. Already looking forward to his book! Sounds like an entertaining book!! I’ll have to check it out when it comes out. I have never seen this site before! OMG this is hysterical! Thanks Melanie! Glad you enjoyed it! They should add in…DO starve yourself the day before your marathon. After 18 weeks of immaculate eating and training, the only thing that can mess you up now is a mild bloated feeling from rice and white bread. Stick to 1000 calories or less the day before. Oh, wait, I already did that! I never followed The Oatmeal, but I had seen this comic, it was published in the July issue of Runner’s World. That is what I heard – he is really getting out the PR for the book!